In the midst of fall and with thoughts of gray winter days soon approaching, there’s nothing more I could wish for than a vacation on a pristine beach in Barcelona or lounging on the coast of Italy. Being an unemployed college student, however, these dreams will unlikely be fulfilled in the near future. While it seems impossible to fulfill these yearnings, I have found one artist whose photography might be able to do the trick. Meet Gray Malin, a 29-year-old photographer who has recently made his way into the spotlight of the art world. 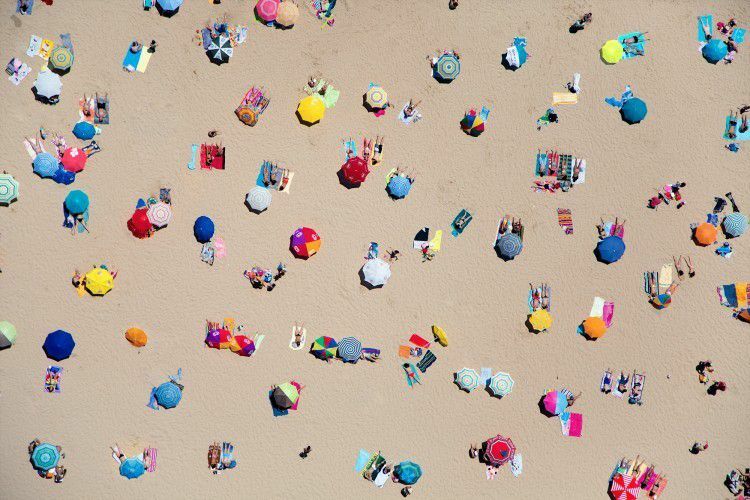 The Los Angeles-based artist is known for his brilliant aerial photos of everyone’s favorite summer activities in dream vacation spots. Dozens of beachgoers are shaded by uniformed umbrellas on the sands of Dubai. Candy-colored pool floats are arranged in mesmerizing patterns against the contrasting crystal-blue water. To take these shots, Malin rides a helicopter thousands of feet in the air. Leaning past its confines, he can capture the perfect image in seconds. Malin goes up into the air with purpose, knowing that he must “find something that, from above, feels like a piece of art.” This is seen through the patterns of color and repetition of sunbathers, among other details. The shots are of course candid, but because of these features, there is something that appears staged or hyper realistic. Growing up in Dallas, Texas, Malin learned photography in high school, but it wasn’t until after a few years out of college that he saw potential in his abilities. Malin gained a respectable amount of popularity in 2009 following his Prada Marfa series in which he collaborated with the locals of a small Texas town. With that, Malin’s hobby turned into a career. Malin now travels around the world, from the frozen glaciers of Antarctica to the scorching beaches of South Africa. Influenced by former employer David LaChapelle and idol Slim Aarons, Malin’s work contains elements of hyperrealism while still being suitable for the walls of a home. Malin has been able to create a successful brand for himself, producing clothing and accessories as well as affordable prints, which are accessible to everyone. Malin’s work is inclusive in multiple ways. First, his work invites the spectator into the image. Viewing his work, Malin achieves his goal to “make every day a getaway.” You don’t have to take an exotic vacation because Malin brings you there. Equally important is the fact that his art is neither pretentious nor intimidating. Malin’s budding lifestyle brand invites everyone to embrace his work whether you don his work on your cell phone case or wear his prints on a pair of sneakers. With each new series Malin continues to invest in his work, which has only brought him more success. In 2015 alone, he was named by LinkedIn’s List of 150 Professionals, 35 and Under, Who are Changing the Way We Do Business and partnered with hotel chain Le Méridien and Sperry Top-Sider. More of his work can be accessed on his website: http://www.graymalin.com.